This doesn’t mean he severed connections with the women of RHOA though. 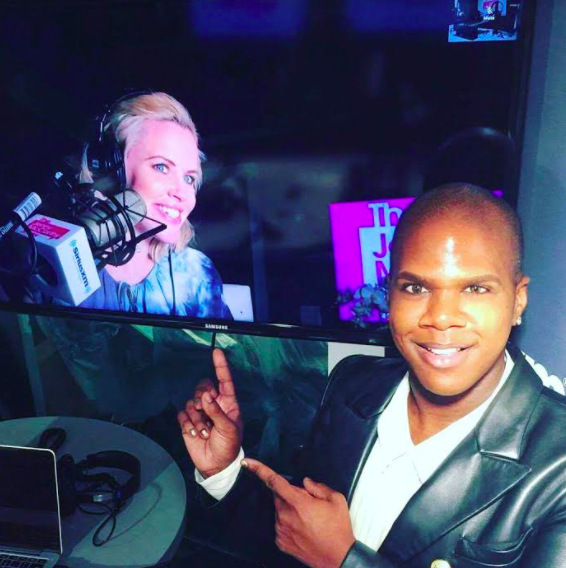 When Miss Lawrence stopped by the Jenny McCarthy Show on SiriusXM, he had plenty to say about the series that got him noticed, and the women who continue to do battle on it. Specifically, Lawrence tells Jenny why he didn’t sign with Kandi, how he thinks Kenya Moore’s marriage is legit, and why he feels like the women of RHOA have culturally appropriated the terms “shade” and “read” from the LGBTQ community. Porsha Stewart Explains Controversial Sermon And Praises LGBT Community; Slams Miss Lawrence! Porsha Williams has been in the midst of an onslaught of bad publicity. From her altercation at the Real Housewives of Atlanta reunion, to accusations that ex-husband Kordell Stewart abused her, to a much-publicized video of her preaching what appeared to be homophobic remarks. After the scandalous videos emerged in the media, Miss Lawrence (known for being both Kenya Moore's BFF and a RHOA institution) called Porsha "ratchet and tacky" on the Russ Parr Morning Show. “Those are her beliefs granted, she is entitled to her beliefs. But if you want to hold true to your beliefs, don’t come over to the LGBT community or gay girls and want us to help you with your hair or want to use your gay slang or want to carry us like your purse. You stay over there and you stick to your beliefs," Lawrence continued. Now it's Porsha's turn to share her side of the story. Also sitting down with the Russ Parr Morning Show, Porsha insists that sermon was taken out of context and Lawrence is the ratchet one! Kenya Moore Bikini PHOTOS! Real Housewives of Atlanta Star On Vacation With Miss Lawrence! Apparently Rita Hayworth always took her hair dresser on vacation with her – and apparently Kenya Moore does too! That's just how the Gone With The Wind Fabulous among us roll. Krayonce recently announced on instagram that she and Miss. Lawrence (of She By SheBroke Weave Singeing fame) are on vacay in Mexico. I hope Kenya brought her fire extinguisher to prepare for any hair-related incidents! Or maybe she could #twirl a fire out. The Real Housewives of Atlanta star also flaunted her booty in some bikini pool shots! Photos of Kenya rocking her Mexican assets are below! Last week was huge for NeNe Leakes. It's no wonder she's been slack on writing her Bravo blog…she's been rubbing elbows with major movie stars and acting on an award-winning sitcom. I mean, seriously, let's all go back to season one when NeNe was drunk and singing in that limo. Did you ever think she would become this much of a legitimate and hard-working success? WIG! Her most recent blog post is definitely assalicious, as she weighs in on the Donkey Booty battle between Phaedra Parks and Kenya Moore. Kenya is also making a name for herself, as most housewives do, by recording a new song. I'm sure you watched it in all of it's glory on Watch What Happens Live, but if not, please, immediately click here. It's oh so worth it. She discusses her debut in a recent interview, and she chats about watching herself on Real Housewives of Atlanta. Did RHOA Hairdresser Lawrence Washington Have His Cosmetology License Suspended? Plus, NeNe Leakes Getting Married On TV! Oh there's always some shady drama business where the ladies and ladies' accouterments of Real Housewives of Atlanta are concerned! One of RHOA's two resident heel-wearing hairdressers Lawrence Washington apparently has some skeletons in his closet as well. Lawrence entered the scene as She By SheBroke's constant companion and stylist, the two have since had a falling out over Lawrence allegedly destroying Sheree's hair. Did he destroy it because his cosmetology license was revoked and he is on probation? According to court documents filed in the State of Georgia, Lawrence's license expired in March 2008 and he did not apply to have it reinstated until 2011. And what was he doing during that time? According to the documents illegally practicing as a hair stylist – and singeing weaves on RHOA, that's what! Lawrence also owns his own salon. NeNe Leakes Lands On The Ebony Power 100 List! Plus, Kandi Burruss Denies Stiffing Lawrence Money For His Song! NeNe Leakes has really made something from this reality TV gig. She certainly is Bravo's one to watch – along with being Andy Cohen's favorite Housewife (he said it, not us!). The Real Housewives of Atlanta star (and she seriously is the star of that show) who moonlights as an actress has just landed herself on the cover of EBONY Magazine's 2012 Power 100 issue. The "Money & Power" issue features a glammed up NeNe bathing in diamonds and sipping champagne because that is how the very, very rich role. Bloop! NeNe's cover hits newstands Nov 5th as the Dec/Jan issue. Well, Ms. Leakes that is quite an honor. Luckily NeNe, who will wear a dress made of money in EBONY, hasn't let all the fame go to her head too much (unless She by SheBroke happens to be in the room! ), NeNe was spotted shopping at a West Hollywood Target this weekend according to People Magazine. The soon-to-be-megastar was there with a friend and buying Sprite.